This is Finty Chester who, at the tender age of seventeen years old, has the distinction of being the youngest trader in Columbia Road Market. Jeremy took a photograph of Finty a few weeks ago, but we decided to reshoot the portrait when we examined it and realised she had a black eye. With cheerful alacrity, Finty explained that she acquired the injury while defending herself against a gang of thieves who stole her mobile phone. I winced to hear this story but, with admirable strength of character, Finty had already put the experience behind her. 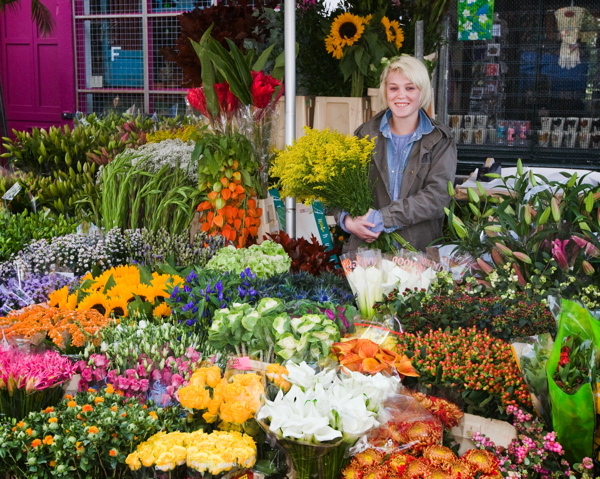 Such is her self-assurance that I had assumed Finty was in her mid twenties – since with her bright energy, charisma and great taste in flowers, she has already established herself as one of the most popular traders in Columbia Rd. No blushing violet, Finty has shown she has the personality to hold her own amongst the loud cries and banter of the more experienced stallholders that surround her, all of whom have become endeared by her spirited approach. The senior flowersellers have taken Finty to heart because she reminds them of their early days. Yet Finty cherishes other ambitions too, she is pursuing media studies with the intention to become a journalist and combine this career with selling flowers in Columbia Road. Finty has the qualities to stay the course, and match Tony Purser’s career and be there selling flowers over fifty years from now if she chooses. But Finty brings a new perspective, shrewdly recognising that a parallel career in media will enrich her life and give her financial security. Finty Chester is the model of a twenty-first century flower girl. Bought gorgeous flowers from this lovely young woman this morning. I deliberately sought her out having read your blog before setting out for what has become a regular Sunday morning trip for us (our eldest son has a music practice nearby so we have an hour to pass). The irises look lovely in our front room. So glad to know more about her.